What will Tomorrow’s Picture Bring? On Saturday evening I went to the movies and saw Philomena. Judy Dench was outstanding in her role, and I hope she is awarded an Oscar for her performance. The movie had a lot of important and controversial issues to reflect upon. As I watched the movie I thought about how integral dialogue has become to telling a story brought to cinema. “Talkies” gave way to a whole new generation of movies for the theatre. Now we are in the digital age of filmmaking which brings more changes to the industry. I used to think that those behind the scenes of making a movie were inconsequential, that the only thing that really mattered was the actors’ performance. I’ve gained a new respect for the entire process of filmmaking since my son is in the business. In deference to all, I now feel it’s necessary to pay attention to the long list of credits at the end of the film. The cast and crew is no longer a half dozen people like during the days of silent movies. With each passing decade the list of technicians who make movies come to life seems to get longer and more impressive as skills of the filmmaking artists become more specialized. 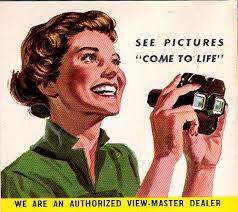 If you are a baby boomer you will remember the excitement of looking at film images through the Viewmaster. How far we have come from looking at film from one of these devices! In retrospect, the idea of getting a thrill by looking at images through one of these devices is now laughable. Techniques of creating visual images sure have changed since the days of the Viewmaster. Now we can even stream film videos from our computers and from mobile telephones! Who would have thunk it fifty or sixty years ago? Throughout this week on All Things Fulfilling, I will be posting other images that will arouse memories for baby boomers. Stay tuned! This blog is brought to you from the space where independent thoughts, words and views are all part of the business. wwww.CornerstoneFulfillmentService.com. See you tomorrow on All Things Fulfilling.